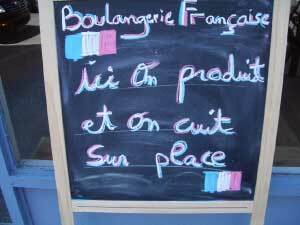 In my posts on real-life examples of French conversation and in the post on how to use these examples, I’ve insisted on the importance of the very common subject pronoun “on.” It is also used often in advertising, as in Fig. 1, to add an informal touch to the message. Fig 1. À la rentrée, on aime ça, changer de lunettes ! Because the teaching of French is generally biased towards the written language, the use of “on” for speaking is not often studied in detail. In fact, if you look at conjugation tables in most reference works, you will rarely see mention of “on.” Here, for example, is a typical table for the present indicative tense of the verb “être” (to be) with the various subject pronouns (je, tu, il, elle, etc.). Every student of French has learned this sort of table by heart. Not a bad idea, but this table is quite misleading. It does not contain the 3rd person singular form “On est” and it does not indicate that “On est” has a very unique property: it can replace all the other forms. On peut voir la cathédrale Notre Dame à droite. You can see the Notre Dame cathedral on your right. En France on aime bien manger. In France people like to eat well. Fig. 2 Ici on produit et on cuit sur place. In spoken French, especially fast informal language, users tend to use the simpler conjugation forms over and over again. What if you could use just one form subject pronoun and verb form in place of all the others? Well, it’s not that simple. You couldn’t really have an entire conversation with “on” instead of “je, tu, il, etc.” But as you will see, that little “on” can do a lot. This use for “you’ is very common when giving instructions or orders. This is the meaning in the Fig. 4. How do you know which meaning is being used? Because this “on” is so flexible and can mean so many different things, how do you know which is which? In many of the examples given above, the translations could have used other pronouns. The only way to determine the meaning is to look at the context. 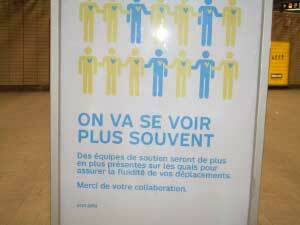 On fait ce qu’on peut avec les moyens qu’on a.
We’re doing everything we can with what we have. I’m doing everything I can with what I have. They’re doing everything they can with what they have. Stanley Aléong is a polyglot, author, musician and language coach in French, English and Spanish. He likes to share his passion for languages and believes that anybody can learn to speak a foreign language well with the right methods and tools. He has also invented a cool visual learning tool called the Language Wall Chart Calendar that is based on his own learning experience. Reach him at info@langcal.com.